Welcome to my Youth Junior Olympic Volleyball National Meeting Web Page. In USA Volleyball speak, that instantly would become the YJOVNMWP, because once you arrive at COS (Colorado Springs) only acronyms, not words, are used to communicate thoughts and ideas. To help you understand some of the acronyms, they even provide New Reps a list of acronyms, so of course I’ve included them here on the site at: CLICK HERE FOR ACRONYM. If you’ve never been to the National YJOV meeting, then I’ve been there once more than you! If you’re an expert, then please let me know what I do not understand. What happens at the NYJOV meeting? Each Region is encouraged to send three representatives to participate in advisory committee meetings dealing with juniors issues. The committees are: Grass Roots, High Performance, Competition, Boys, and Interface. General Forums are meetings for everybody. The advisory committees for each section participate in forums to discuss subjects previously placed on the agenda by the YJOV Division. The Juniors Coordinators and Directors were asked to provide agenda topics prior to the meeting. Of course the Advisory Committee in attendance could request “new business” but the agenda was typically full for the time periods allowed over the 3 days of meetings. What do the Advisory Committees do? The General Forum and advisory committees engage in discussion and are asked to submit recommendations on each topic. The recommendations should include brief statements of Rationale ‘for’ and ‘against’ the proposals, or a recommendation that no action be taken. Each Advisory Committee then submits its recommendation to the respective YJOVD Commission for consideration. If approved by the Commissions, then MOTIONS are drafted (based on the recommendation, or as modified by the Commission). The MOTIONS then move up the decision making ladder. Click HERE for the Complete YJOV Organizational Chart. What happens to the Motions from the YJOVD Commissions? Many are forwarded to the Ethics and Eligibility Committee so they can weigh in on whether the Motion is feasible, or what modifications might be required to insure that the Motion is consistent with the National Championship Division, the Amateur Sports Act, the US Olympic Commission, and to the extent applicable the International Requirements of the FIVB. As approved by the E&E, the motion is then forwarded to the Administrative Council, who may also entertain, edit, or remand the Motion as appropriate. If the Administrative Council approves the motion, it is then considered by the ROD Board (Regional Operating Divisions) which is comprised in part of the Commissioners of each USA Volleyball Region. The ROD next meets in early October. The ROD may entertain, table, edit or remand the Motion. Once approved by the ROD, the motion is forwarded to the Executive Committee of the USAV Board of Directors, who may then include it in the Board of Directors Agenda in January. Of course, the Board of Directors may table, remand, modify, reject or approve the Motion. 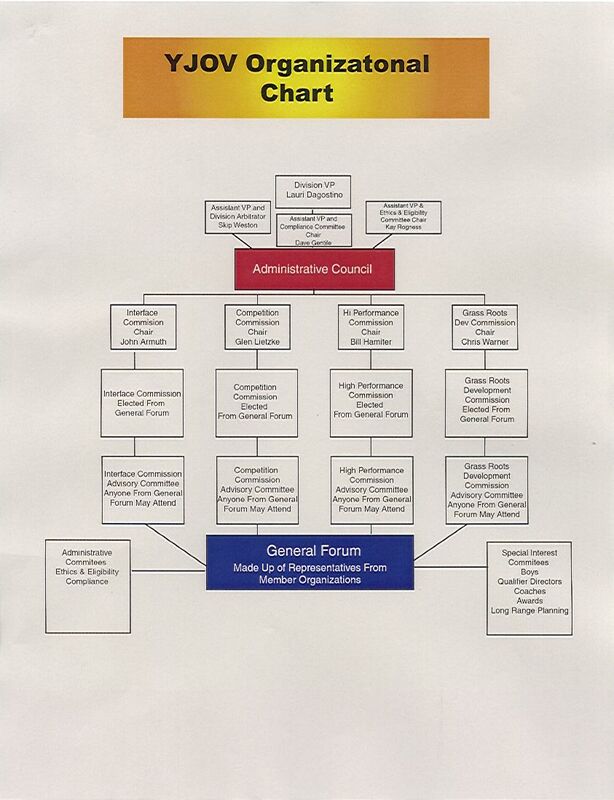 Click here to see the YJOV Organizational Chart. When will the Motion take effect? Approval of the Motion would take place in January, and become effective after that, or at such other time as the approved form of the Motion would require. So what is on this NYJOV page then? This is where we are now. These are the ideas that were circulated and discussed, and the Motions made by the Commissions. The chain of command does not REQUIRE a committee to initiate the process. The YJOVD, ROD, or Board of Directors may also consider any other issues they initiate on their respective agendas. So what can the membership do with the information on these pages? Let the Juniors Representatives and Commissioner know your ideas on these topics, so they will know how to best represent your interests at the NYJOV, and ROD meetings throughout the year.